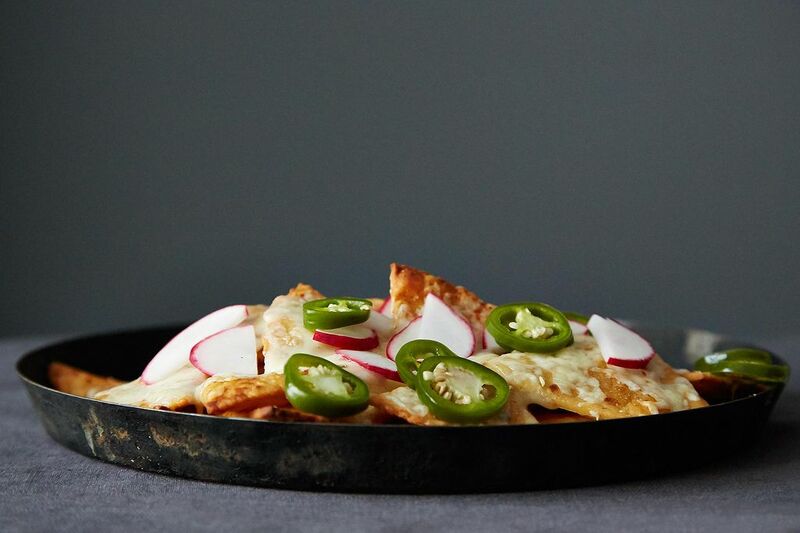 Today: Lee Frank, Managing Editor of Nachos NY and co-author of Ultimate Nachos, shows us how to make the ultimate crowd-pleasing, cheese-loaded, crispy-chipped food from scratch -- no recipe needed. Nachos, though often derided for being a movie theater or stadium food, are a gift that can be shared by many. They can be made in the microwave (not recommended) and be simple, or they can get as difficult as poached pear and gorgonzola dessert nachos. Made right, nachos will please any group. Things to focus on if you want amazing nachos: quality ingredients and a strong layering ethic. 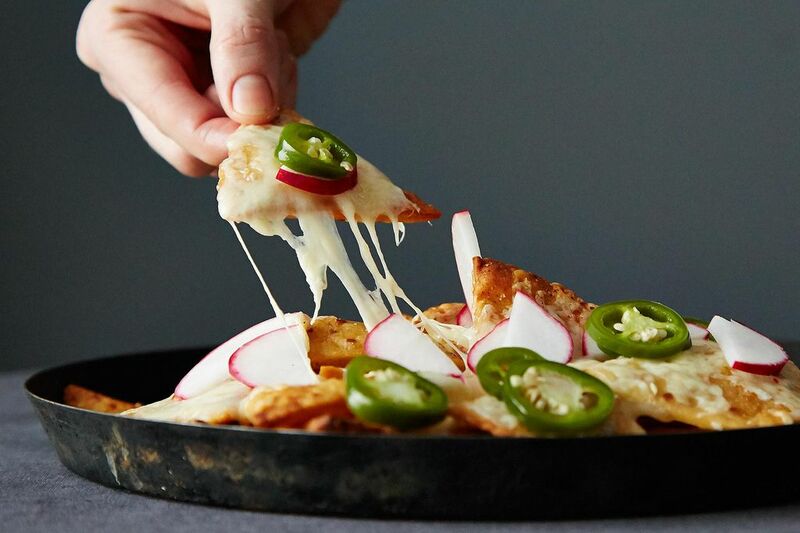 With a good layering technique, you can ensure that the nachos will have cheese and jalapeños through every grab and every bite. We suggest making your own chips and quick-pickling jalapeños for maximum wow factor and deliciousness. This might seem like a daunting task, but it is incredibly easy and the return on investment is massive. We're keeping it simple here with cheese and jalapeños, but other innovations can be made with toppings such as chorizo, carne asada, or no-recipe guacamole. Other cheeses we'd suggest are Colby Jack or Chihuahua, or, if you're making a variation like pizza-style nachos, mozzarella. As long as the cheese melts, it will make for a delicious nacho. 1. Whisk a cup of apple cider vinegar with two tablespoons of sugar and a bit of salt. 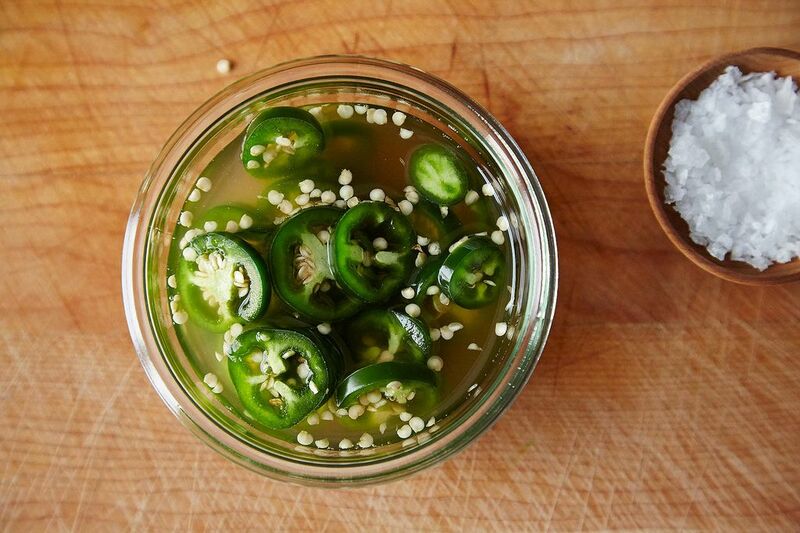 Slice jalapeños into a jar and pour the vinegar mixture over them. Close the jar and refrigerate the jalapeños overnight. 2. 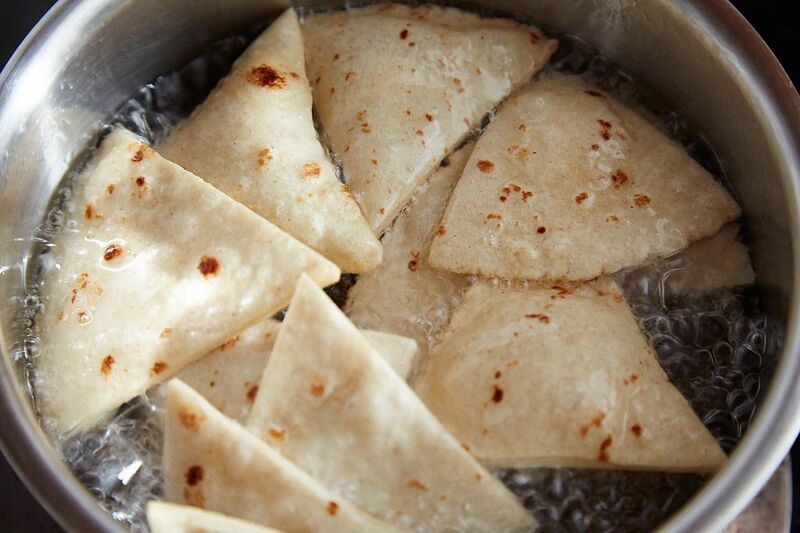 Slice storebought corn tortillas into triangles (Ed. note: ours were a corn-flour hybrid, which works too). Use a whole bag to support a big party of nacho eaters. In a shallow pan, heat vegetable or canola oil to 350° F. Use a thermometer, or just test the temperature by dropping a small piece of tortilla into the oil -- you're ready to go as soon as the tortilla floats and bubbles. More: Learn how to deep-fry without fear. 3. 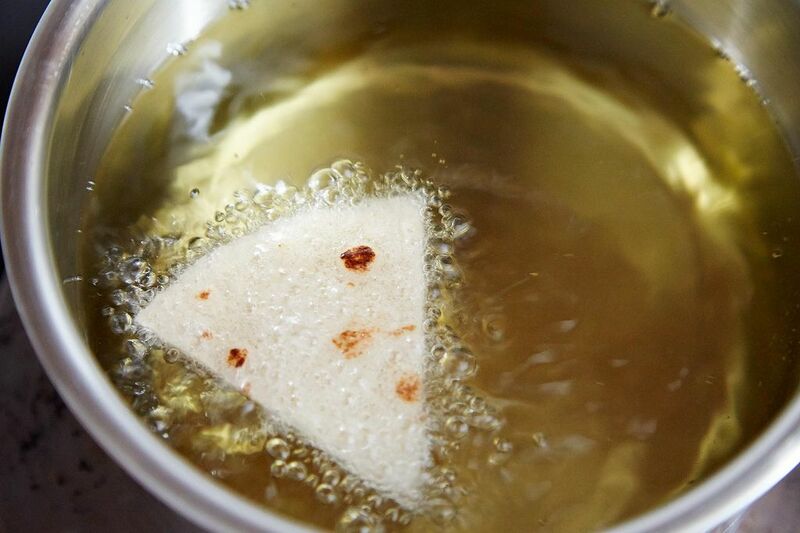 Fry tortilla triangles until both sides are golden brown. Remove the chips to a paper towel to drain excess oil, then toss the chips with salt and cayenne pepper. 4. Shred your cheese -- we used half a block of sharp cheddar cheese and half a block of pepper jack. 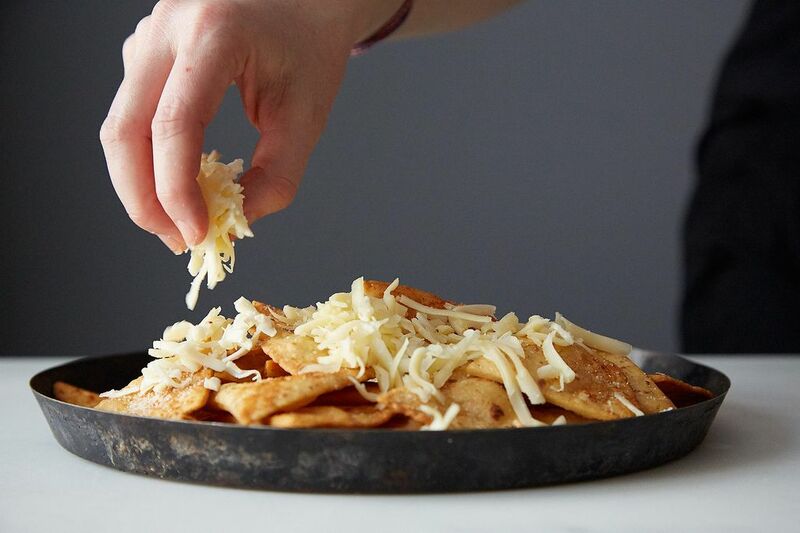 On a baking sheet, spread half of the chips evenly and sprinkle heaps of cheese all over. It's always good to add more cheese than you think you need. Layer the remainder of the chips and the cheese. 5. Broil or bake at 500° F until cheese is melted, or about 5 to 8 minutes. Top with pickled jalapeños and sliced radishes, or whatever you like. We're looking for contributors! Email [email protected] and tell us the dish you could make in your sleep, without a recipe. Check out what we've already covered. Nacho fanatic (believe me, I have a shirt that proves it) and half of the Nachos NY duo that published Ultimate Nachos: From Nachos and Guacamole to Salsas and Cocktails. Also novice instagrammer @leemfrank and Brooklyn Nets cheerer. Please do not layer Nachos. They are at their goodness after making individually( bean or meat layer, then cheese, topped with jarred or fresh jalapenos)then baked till crispy with a good brown hue on the cheese. YUM!! I think I know whats for supper tonight! And will definitely try the pickled jalapenos. The best nachos I've ever tasted in my life were baked with enchilada sauce on them; give it a try if you haven't already-- really good! Yum! That sounds delicious, but makes me worry that they would get soggy. How do you keep that from happening? You have to three bears it, get it (quantity) just right. I think it's all based on the amount of chips you use. Oh yeah, Kelli, I know just what you're talking about! If you get the sauce hot enough you can just ladle it on without baking and it won't make the chips soggy. I've made them with homemade green chile enchilada sauce, also. ALL good! Along with the cheese and jalapenos, I've added a plop of guacamole, sour cream, pico de gallo, refried beans and sliced olives. Called them Nachos Supreme and couldn't make them fast enough to please the crowd. You can get as creative as you want with nachos. Absolutely! Truth be told, if they are good enough I prefer them without meat--- this coming from a meatlover! So do we! It's one of our nacho commandments! The problem with just throwing on cheese is that it cools quickly, reverts back to its orignal texture, and becomes stiff and glumpy, gluing the chips together. Very unappetizing. I am speaking from experience. You'll get much better results if you melt the cheese thoroughly first in a wee bit of light bechamel, or stir it in to a little sour cream. What you essentially want to do is create more of a "cheese sauce" that will flow over and coat the chips. Add some diced green chiles to this if you really want to rock it. Sprinkle even more cheese on this mornay sauce before baking and you'll be smacking your lips! BTW, radishes are routinely served, along with pickled jalapenos and carrots as a garnish with soft tacos in my heavily Mexican-populated city in California. Different cheeses take on different textures when heated and cooled. If you don't like the way your cheese comes out, A cheese sauce is a good option. Though, I gotta say, you find cheese sauce nachos at the fast food place, but at a proper Mexican restaurant they sprinkle shredded cheese and melt it. Where in California are you? It's a pretty big state, so you can be in California yet be hundreds of miles from Mexico. The Mexican restaurant in your town might have radishes because that is what the customers want. Just like the Greek restaurant here has jalapenos because that is what the customers want. I live pretty close to Mexico, at night I can see the lights of Tijuana from my deck. You're right, different cheeses do melt differently, but they all seize up again when they cool. It’s science. I created a variety of nachos to accompany cocktails at my restaurant. So I had to deal with the stiff cheese problem. Fact is, the true beauty of nachos is the gooey goodness of the cheese sauce itself! I live in Oakland CA, in the Fruitvale District. I am one of the few English-speaking people for miles. Beautiful people, beautiful food. I've studied the cuisine and its history (from Pre-Colombian on) and cook it daily. There is not just one Mexican restaurant in this town; there are two on every block. NONE of them serve nachos OR fajitas, which are American creations and not to be found in "proper" Mexican restaurants. If you're ever up this way I'd be glad to take you for a stroll down International Blvd. to feast on some delicious, authentic food from every region in Mexico. Brush up on your Spanish first, though! You are right, Mexico is a large country with many regions, each with its own unique cuisine. Additionally, California, New Mexico, and Texas used to be part of Mexico, and each of these states also has it's own unique Mexican cuisine. Nachos is a fairly recent invention, I think from New Mexico? Thanks for the tip, now I know where to find good restaurants next time I'm in Oakland! Nachos are from Piedras Negras in Mexico. They are new, created in the 1940s. You do not need a cheese sauce for nachos, but cheese sauces are not required. Nachos with a melted cheese are delicious and last as long as the incessant demand will last. Sorry. That should say, you don't need a cheese sauce for nachos, but cheese sauces also aren't banned. I am new to this web site & think the recipes are fantastic however I am not able to find those that I have saved. What am I doing wrong? Judi, go to the upper right hand corner of your screen and click on the little person icon (for me, it's my own face, but I have a profile image and it looks like you don't yet). Then click on "favorites and collections" and you should find what you're looking for. FYI it looks like the interface changed recently and "saved" recipes are now "favorited" recipes. I'm excited to try those pickled jalapenos. Thanks for the recipe! I don't think any Mexican would consider putting radishes on Nachos. Had to say it. I am sure it is tasty. My reaction was sort of like what an Italian would feel seeing a Chicago-style pizza. Yummy, but not really authentic pizza. Just about anything will go with tortilla chips, but radishes are not a new-world vegetable. That's what makes American food great, we can combine stuff from all over the world that historically and geographically would never be found on the same plate and create amazing new tastes! For the record, Mexicans get a kick out of seeing what passes for Mexican food in the US. As you go farther north of the border, it gets stranger and stranger. But then, I have seen some Greek places here offer jalapenos as an option. I suppose it depends on what flavor you are used to in your food. yo isn't this a recipe? I absolutely love mexican food, especially nachos. Unfortunately, I haven't been able to have them since I went vegan. I frequently make tacos (http://www.veganosity.com/food/vegan-black-bean-and-zucchini-tacos/) and such and those work out quite well. I'm hoping to figure out how to make these vegan without sacrificing the textures and flavors! Hi Alex! Missing nachos is understandable. In our book, we have a great recipe for vegan queso using white bean, tahini and salsa. This would definitely work for vegan nachos! Thanks so much! I'll be sure to check it out! I'll definitely have to check that out! Thanks so much for the tip! Hi Veganosity, you know, nachos is just basically tortilla chips with fixin's. You can melt cheese on them, but usually we just serve it with salsa or guacamole, both of which are vegan in their natural forms. For a nice salsa fresca, finely chop tomato, onion, peppers (jalapeno is a favorite), and cilantro. For the guacamole, just mash some avocado and add a little lemon or lime juice, and maybe a little salt and minced onion if it needs more flavor. If you can't get fresh avocados, there are some good packaged guacamoles in the refrigerator or freezer section. Vegan nachos are a cinch these days with the plethora of great vegan cheeses available. We rarely use them on ours, instead preferring to let the ingredients shine through. For example, refries, green onions, avocados, tomato - the list is endless!